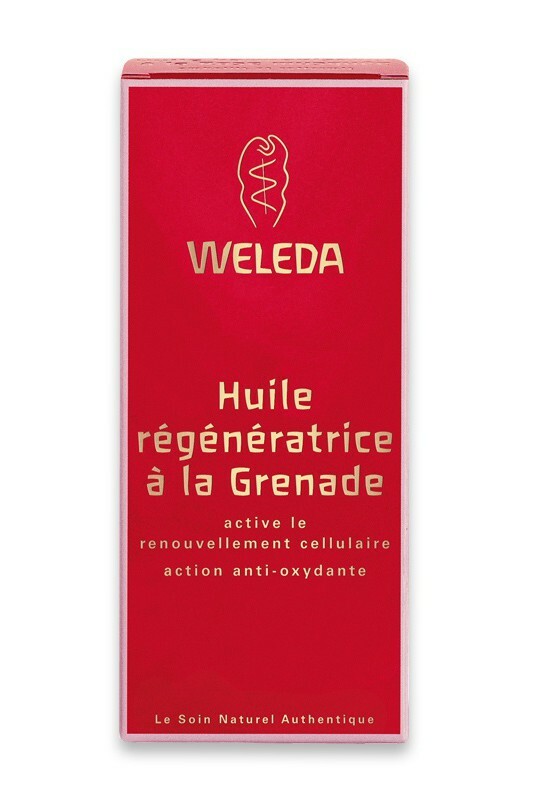 Aging and tired skin is revitalized by Weleda Regenerating Organic Pomegranate Body Oil , which visibly firms and renews with natural antioxidants. This natural oil moisturizer is a nourishing full-body treatment that regulates moisture balance and restores your natural vitality with potent antioxidants and essential fatty acids. Organic pomegranate seed oil contains powerful antioxidants that help promote skin renewal and protect against free radical damage. Weleda Regenerating Organic Pomegranate Body Oil also contains Organic jojoba seed oil preserves your natural moisture and acts as an emollient in this natural oil moisturizer, nurturing your skin and improving its firmness. 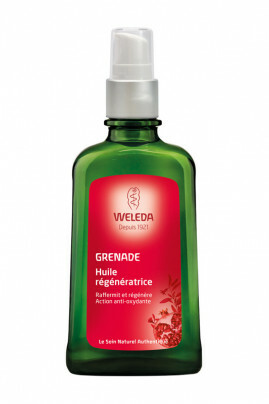 Apply a small amount of Weleda Organic Regenerating Pomegranate Body Oil to damp skin. Massage in a circular motion (always toward the heart) until it is absorbed. Simmondsia Chinensis (Jojoba) Seed Oil, Sesamum Indicum (Sesame) Seed Oil, Helianthus Annuus (Sunflower) Seed Oil, Triticum Vulgare (Wheat) Germ Oil, Macadamia Ternifolia Seed Oil, Panicum Miliaceum (Millet) Seed Extract, Fragrance (Parfum)*, Punica Granatum (Pomegranate) Seed Oil, Helianthus Annuus (Sunflower) Petal Extract, Olea Europaea (Olive) Oil Unsaponifiables, Limonene**, Linalool**, Citronellol**, Geraniol**, Citral**, Eugenol**, Coumarin**, Farnesol**.